A tripod is very important to photographers as they need to stabilize and elevate their camera especially when the light levels are low. That’s the reason many photographers like to carry a tripod around. For maximum strength and stability, the conventional tripod is designed into a three-legged stand type. This type of tripod is stable but a bit heavy and bulky. If you are looking for a more flexible and lighter tripod to help you, perhaps you can find your solution with Gorillapod. 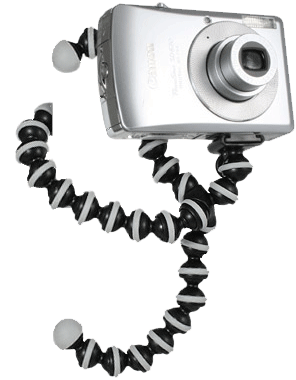 Gorillapod is the lightest and most versatile camera tripod available today. These funny looking mini tripods come in a variety of sizes to suit everything from compact digital cameras to full-sized, zoom-lens equipped DSLRs. The main different about the Gorillapod is that the legs are made up of many interlocking ball-joints that can bend, twist and rotate. The legs can be twisted and firmly hold your digital camera to any surface. Each ball joint has a grippy silicon band to provide the grip required to let photographers bend the legs around and grip almost anything vertically without slipping.